In terns of heart health, substituting cauliflower for carbs seems like a great idea (I’m gluten-free, so these recipes interest me for other reasons). I clicked a few of them, though, and the sheer amount of fat involved in these recipes negates any weight benefit most people would see from skipping the carbs, and certainly most of the cardiac health benefits. This is a common problem with fad recipes and diets – when you take away one source of flavor – like fat – and your palate will ask you to replace it with another source of flavor, like sugar or salt. That’s why eating fresher food in moderation is a better diet plan than 98% of what of the advice you get. Fresh foods are not packaged, moderate serving guides are easy to find – A serving of meat is the size of your palm. A Blooming Onion, on the other hand, is a day and a half’s worth of calories and 4 DAYS worth of fat. I have a cauliflower recipe with almost no calories – steam it, blend half with a little broth, pour the blended half over the chunks and bake it for 20 minutes. It’s rich and delicious and has about 20 calories a serving. Feel free to try one of these very tasty looking cauliflower recipes – please let me know how they go. Just remember that if the cheese to cauliflower ratio is 3:1, it probably isn’t helping your heart. Heart disease is the leading cause of death for Americans, and has been for many years. There are a lot of reasons for this – some of which have been discussed in previous posts. 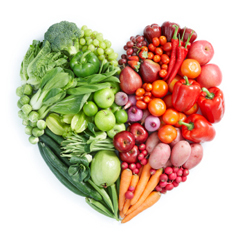 One of the contributing factors in heart disease is diet. You have to remember that food is the fuel your body runs on – cheap, processed food is even worse for your body than E85 gas would be for your Ferrari (I don’t have one either, but you’ll remember the image). Americans have a terrible diet. The cheapest food available to us is the worst for us – but we know that if you’re feeding three kids dinner and you have $10, you’re hitting the fast food. In a more heart-healthy world, the cheapest food would be the freshest, and the drive through would be cost-prohibitive. All things in moderation, and the fresher the better. Students often tell me that they don’t know where to begin to improve their diets – I tell them to eat 10% cleaner. You can cut 10% of the junk out of your diet – use skim instead of cream in your coffee, or eat an apple in the afternoon instead of a candy bar. Make one meal a week with turkey instead of beef – or veggies instead of meat, brown rice instead of instant or regular white rice – these small changes can help improve your health. Once you’ve done it for a month…do it again. It’s a pretty painless way to improve your overall health. Obviously, if you have a specialized diet – if you have high blood pressure or diabetes, you should continue to follow that diet even as you clean it up. Packaged foods – especially “healthy” frozen meals, are not very helpful. Flavor in processed food only comes from salt, fat or sugar. When they remove the fat, the salt content skyrockets. You can learn more about reading nutrition labels at Nutritiion.Gov. To learn about changing your family’s eating habits, check out our friends at Revitalized Nutrition. If you combine your dietary improvements with moderate exercise and appropriate medical care for any underlying medical conditions, you’ll be well on your well to better health.